The skull looks most similar to Nemegtomaia, but my bet is this is a generic oviraptorid model not based on any real specimen. I suspect a few of the bones are built from authentic pieces, but in general this is based on Nemegtomaia barsboldi, which includes and is largely limited to the skull, pre-caudal vertebral column, and small portions of the hips and forelimb. Yeah, the legs seem to be in a very weird position! Still cool to see the bones and that looks to me like a very good skull. It appears to need leg braces. 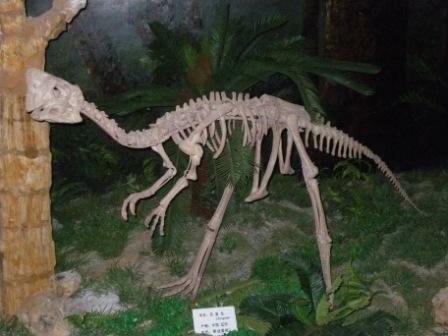 I have some pictures from a traveling Chinese dinosaur exhibit of an “oviraptor” that was reconstructed without scapulae. Just humeri stuck to the ribs. That must have presented some difficulty for the poor beast. Yeah, the hands are bizarre. And what’s going on with the ischia – is that normal-looking?